A New and Accurate Map of the Russian Empire 1792. 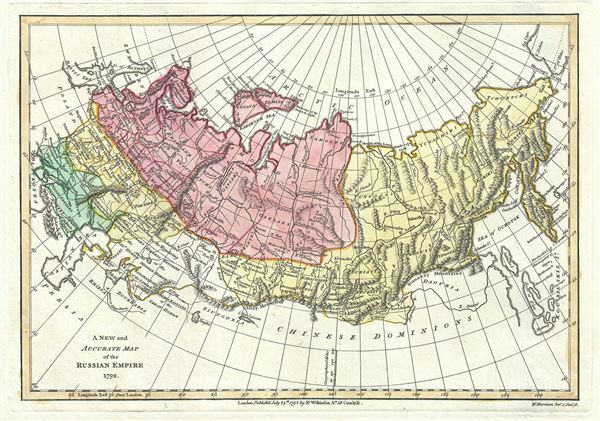 This is a scarce and beautiful 1792 map of the Russian Empire by Robert Wilkinson. It covers the lands claimed by Tsarist Russia from the Black and Baltic Seas fully across Asia to the Bearing Strait and the Peninsula of Kamchatka, and from the Arctic Ocean to Chinese Tartary and the Caspian Sea. In addition to cities and provinces, this map notes geographical features including mountains, rivers, plains, swamps and forests. Displays the river systems of Siberia and central Russia with surprising accuracy and detail. This map is most interesting in its extreme eastern portions, which, when this map was drawn, had only recently been explored. The explorations of Vitus Behring are very much in evidence with regard to the form of Kamchatka and the extreme northeast of Siberia. Hokkaido appears as Matmay. Identifies Behring Island off the coast of Kamchatka, where the great Arctic navigator ultimately met his doom. This map was engraved by Thomas Conder and issued as plate no. 6 in the 1792 edition of Robert Wilkinson's General Atlas.